In spring 1962, a young black girl named Etta Hemsley is killed at a civil rights demonstration on a university campus in Atlanta. The next day, the home of Jovita Curry, a black woman in Overton, Georgia, is burned. Both events are etched into the memory of Cole Bishop and eerily play out the predictions of a former classmate named Marie Fitzpatrick. Both Cole and Marie are high school seniors when they first meet in fall 1954. Cole, like his classmates, is a native-born Southerner accepting the traditions of segregation as a way of life. Marie is a recent transplant from Washington, DC, a brilliant and assertive nonconformist with bold predictions about a new world that is about to be ushered in by the force of desegregation. Included in her prophecy is a warning for Cole that will cause him to leave the South to live and teach in Vermont. The odd friendship between the two of them continues after high school in a series of tender and revealing letters. The story revolves around the fiftieth-year reunion of the Overton High School class of 1955, rekindling for Cole memories of Etta Hemsley’s death and the unsolved mystery of the burning of Jovita Curry’s home. His return for the reunion reunites him with classmates who, over time, have accepted a guarded assimilation of the races. He is also reacquainted with two black men—Moses Elder, the town’s mayor, and Littlejohn Curry, a reclusive artist who carries the scars of the burned house, and in those encounters, Cole understands clearly the influence of Marie on his life. 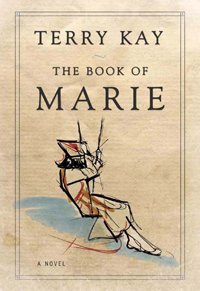 The Book of Marie is the story of a generation—whites and blacks—who ignited the war of change. Yet, it is also as much about the power of place— the finding of home—as it is about the history of events.